Most of my dreams aren’t worth remembering. I sometimes dream about ex-boyfriends or falling from high places. I often dream about being late, or unprepared. When my friend asked me to preach at her ordination service, I dreamed I stood in front of a sanctuary full of people and had no words (even in my dream, I knew this was not about her but about me). Then the fire alarm sounded, sprinklers let loose on everyone, and they all ran out of the sanctuary. It was only then, standing soaking wet in that empty, sacred space, that I realized I had something to say. But by that point everyone else had seen the reception tables all set up and they wanted to stay outside and snack, so I never got to say it. And as a child, I had this recurring dream featuring a giant Chinese dragon dancing merrily through the aisles of the corner convenient store, as my friends and I tossed a beach ball over the candy and chip displays. And though those are all obviously deeply meaningful, in ways I, uh, can’t even begin to explain… there’s really only one dream that I think was a message, a gift, sent not to chastise or confuse me but as comfort and blessing. It was a dream I had within the first week after my second son’s birth. In my dream, he was just as he was in waking life: tiny, and unaware, and brand-new. I was walking with him, cradling him, and he was wrapped in soft blankets. I walked down a series of stairs. 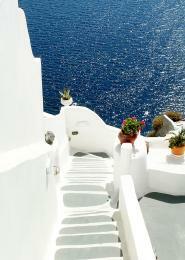 The whole landscape was white rooftops and stairs against a deep blue, sea and sky, a Mediterranean-style scene. The path of my descent took what seemed like ages. When I reached the bottom, my mother’s mother – the woman who, growing up, I’d always referred to as “my grandma with the red hair” – was waiting. She took my newborn son from my arms and held him in her own. She spoke softly to him but I couldn’t make out her words. She rocked him back and forth. Then she handed him back to me, and I ascended the stairs. My grandma with the red hair died almost two years before my second son’s birth. I’d been sad, after he was born, thinking he’d never get to meet her, thinking how strange it is that my family and his family are somehow the same and yet made up of different people. But that night, almost as if my sadness had been an invitation, my grandmother visited my dream to meet my son. That moment came back to me the other day, the way that dreams sometimes catch you by surprise in your waking hours. I told my son, now five years old, about it. But he’s feisty, like she was. Loves candy, and hides it, like she did. Speaks his mind. Relishes a good joke. Gets mad for no good reason. All her traits. How much of that could she have taught him in those brief whispers at the bottom of that long staircase? I don’t know. I don’t know if the dead hang around, waiting for moments to reappear among the living, to pop into our days or our dreams. I know it doesn’t happen always, or even often. But I also know that we are part of one another. We live in and through each other. And maybe thin boundaries like the one between life and death don’t get to determine exactly how that happens. Tags: ancestors, connection, dreaming, generations. Bookmark the permalink. Insightful, wonderful memories and inspiring. Thank you.